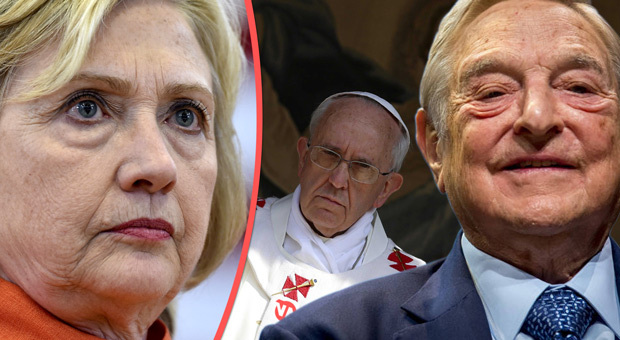 A group of high-ranking Catholic Church insiders has blown the whistle on a coup that was orchestrated by Hillary Clinton, George Soros, and then-President Barack Obama to overthrow Pope Benedict and install their own undercover operative – Pope Francis. The group of Catholic whistleblowers consists of global key figures say they have evidence to expose the conspiracy designed to occupy one of the most influential roles in the world with “one of their own” operatives. According to the insiders, Pope Francis has been installed to push New World Order policies such as open borders and “global warming” by convincing his army of loyal followers that it’s the “will of God”. Pope Francis has been an advocate of a single world government and has been a very public critic of Donald Trump‘s decision to withdraw the US from Paris Climate Agreement after branding climate change a “hoax”. He has also made no secret of his disdain for Trump, yet always shown keen support for the Obama Administration. The group of whistleblowers has reached out to President Trump directly to expose the plot.In an open letter, they have cited several sources of evidence for the Deep State coup, including Hillary Clinton’s emails that were obtained from John Podesta by WikiLeaks.In the emails, they discuss their plans for a regime change and describe the then-current leadership as “middle age dictatorship”, with a plan they dubbed a “Catholic Spring” revolution in reference to the “Arab Spring” coups that had been previously organized. Reversing recent collectivist trends will, by necessity, require a reversal of many of the actions taken by the previous administration. Among those actions, we believe that there is one that remains cloaked in secrecy. Specifically, we have reason to believe that a Vatican “regime change” was engineered by the Obama administration. We were alarmed to discover that, during the third year of the first term of the Obama administration your previous opponent, Secretary of State Hillary Clinton, and other government officials with whom she associated proposed a Catholic “revolution” in which the final demise of what was left of the Catholic Church in America would be realized. Approximately a year after this email discussion, which was never intended to be made public, we find that Pope Benedict XVI abdicated under highly unusual circumstances and was replaced by a pope whose apparent mission is to provide a spiritual component to the radical ideological agenda of the international left. The Pontificate of Pope Francis has subsequently called into question its own legitimacy on a multitude of occasions. During the 2016 presidential campaign, we were astonished to witness Pope Francis actively campaigning against your proposed policies concerning the securing of our borders, and even going so far as to suggest that you are not a Christian. We appreciated your prompt and pointed response to this disgraceful accusation.